A loan of $6,000 helped to purchase equipment and essentially launch my bitters business! Bitters take time to make, and this would allow me to focus my time and resources on getting my product made and into the hands of bars and restaurants across the country. I was born in Maryland and raised in Syracuse, New York. After suffering through many years of excessive snow, I felt it was time to move to a warmer climate. I found myself moving Chattanooga only six months after visiting it for the first time with the promise of a job working at a bar that was not yet open. I found out nearly two weeks before the bar's opening that I would be bartending, and instantly fell in love with the beverage industry and specifically the history behind spirits, craft cocktails, and bitters. To further my education and understanding on this subject matter, I started studying herbalism and began volunteering at a local farm. This new knowledge, combined with my love of the industry, led me to start creating bitters at home -- namely just to understand them better. This passion continued to grow, and when I realized there were no bitters in Tennessee, I had to do something. It was almost a Eureka! moment when I realized I could combine all of the things I loved into one business -- cocktails, herbalism, and bitters. My plan for this business is to continue to grow and educate people on the importance of herbalism, using authentic ingredients in cocktails, and keeping the history of our incredible industry alive through small, amber bottles. Thank you for helping me on this journey! It helps a female entrepreneur launch her small batch herbal bitters company. With the rise of craft cocktails, bitters just aren't bitters anymore. Most craft bitters companies focus on flavor over the beneficial qualities already existing in the herbs and botanicals around us. There are very few craft bitters companies that bring the world of herbalism to craft cocktails, and fewer who seek out local farms and resources to create them. As it would be, there are no small batch bitters companies in Chattanooga, Tennessee or Tennessee in general. The Bitter Bottle aims to be the first legal small batch bitters available in the state of Tennessee. We are different and necessary to the craft bitters market, because we are bringing back the art that is bitters. All of our tinctures and bitters are created with ingredients that are consciously and ethically sourced. We take each ingredient into consideration and do not follow the same recipe or process each time, despite knowing that many in our market do. 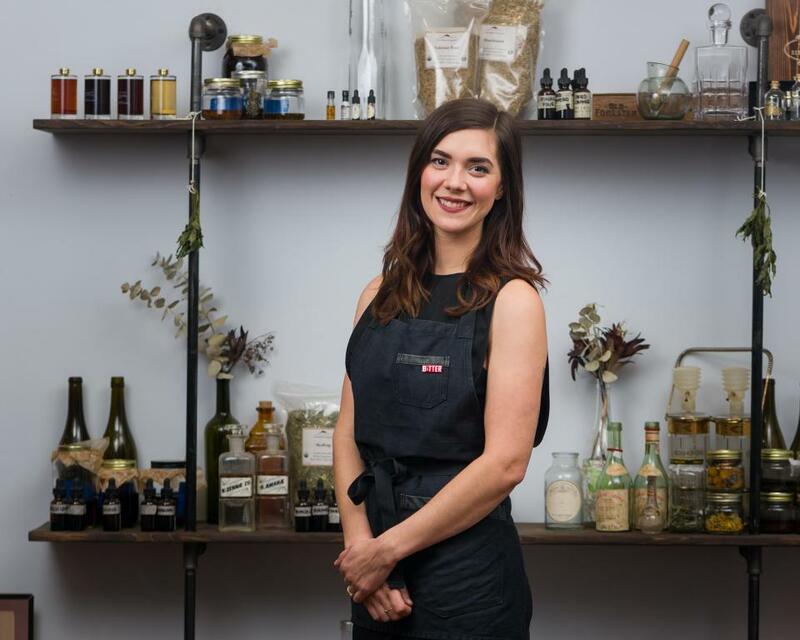 In an effort to bring authentic ingredients and an awareness of wellbeing to the forefront of craft bitters, we try to keep things simple and create all of our products using the techniques of modern herbalism to create products that you can feel good about. In addition to creating products that excite us, we actively work with local farms, distilleries, and bars to create what our peers in the hospitality industry are looking for and anxious to work with and taste. Recently, we have seen craft bitters companies focusing on flavor, using artificial ingredients to achieve their goal. On the other side of the spectrum, most herbal companies focus solely on the medicinal qualities and extraction methods; not the flavor. The Bitter Bottle is a happy marriage of the two; flavor forward, conscious bitters created as a toast to good cocktails and good health. What is the purpose of this loan? As it turns out, Tennessee has never legally had a small batch bitters company ...ever. For the last two years, we've been working hard to adhere to all of the rules and regulations in this industry and at the same time make a quality product. In addition to all of the legal work, our product takes about 2 months to create (from farm to bottle). This loan would allow us to purchase equipment necessary for our production facility ($1000). pay our rent ($2000), our graphic designers working on our website and labels ($2000), as well as our insurance and licensing ($1000) while we are in that period of "making" our first product line. This is the type of organization that the Trustee is. Trustee tiers determine the number of endorsements a Trustee can make and what loan sizes they can endorse. All Trustees begin as a pilot and can advance in tier depending on their borrowers' repayment performance. This is the location where the Trustee is based. Time on Kiva shows the number of months a Trustee has been endorsing loans on Kiva for funding. This figure represents the total number of loans endorsed by this Trustee that have fundraised on Kiva. This figure includes the total amount of loans that this Trustee has endorsed. This excludes refunded loans. This figure represents the number of loans endorsed by this Trustee that are currently fundraising or fully funded. This figure represents the number of loans endorsed by this Trustee that are currently paying back on their repayment schedule. This figure represents the number of loans endorsed by this Trustee that are currently paying back behind their repayment schedule. This figure represents the number of loans endorsed by this Trustee that have completed all repayments. This figure represents the number of loans endorsed by this Trustee that have ended in default. This figure is the total amount of money currently collected by borrowers endorsed by this Trustee, divided by the total amount of money currently due from borrowers. This excludes payments made ahead of schedule. Why are you endorsing Kaleena? Kaleena is a manager of a well respected establishment in Chattanooga and has shown a lot of hard work and perseverance in her work there and has done the same here, through CO.STARTERS as well as leveraging other resources that CO.LAB has to offer. We've been thrilled to see how much she has accomplished in an industry that is not well known in Tennessee. Also, her positivity, passion and joy are quite contagious - we're excited to see what's next for her!